This warm, easy and satisfying dish is perfect as lunch or a light dinner, or as a side dish. Remove any tough, dark leaves on the outside of the escarole. Rinse out the whole head of escarole well to remove any dirt or sand. Cut the head of escarole in half carefully. You want to keep the core in tact so the half pieces don’t fall apart. 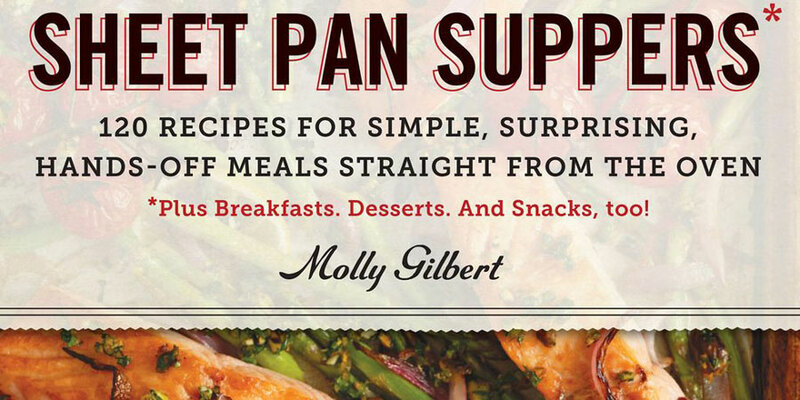 Place two strips of bacon on a rimmed baking sheet, or other baking dish with low sides. Place in upper third of preheated oven and cook until just turning brown. You don’t want crispy, dried out bacon for this, so don’t let it go that far. Put a dollop of whole grain mustard on each slice of bacon. 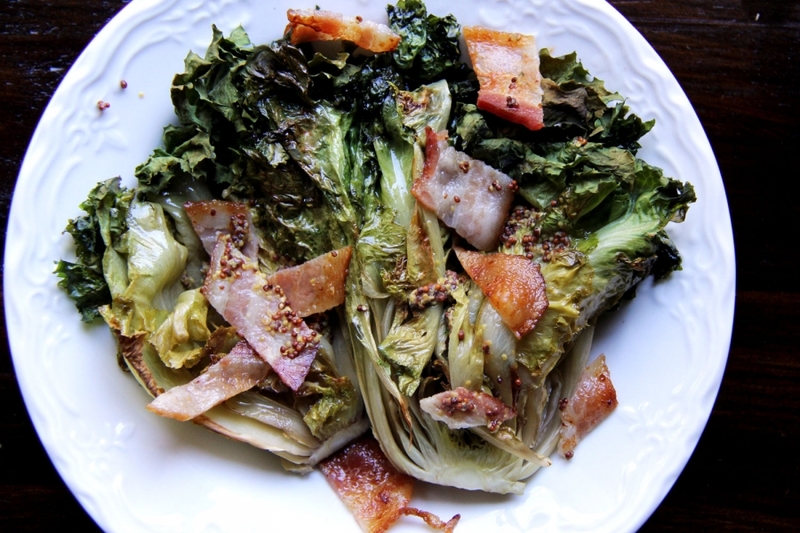 Place one half of escarole, leafy side down, on top of each slice of mustard covered bacon. Cook for ten minutes. Turn each escarole over carefully, keeping the bacon and mustard on top. You now have two halves of escarole, leafy sides up. Each half should be covered with the bacon and mustard. Cook until bacon is lightly browned and escarole is wilted and browned in some spots. I cooked mine for 12 minutes, but you may need to cook longer. This depends on how large your head of escarole is, and how wet it was to begin with. If you want, you can also turn on the broiler for the last few minutes of cooking, but you will need to watch it to make sure your bacon does not burn or overcook. When your are done cooking, remove from oven. Remove bacon slices to cutting board and chop into rough pieces. Plate your escarole carefully, to retain the mustard and juices. Sprinkle with chopped bacon. Why do I call this braised, when it seems like I am roasting it? 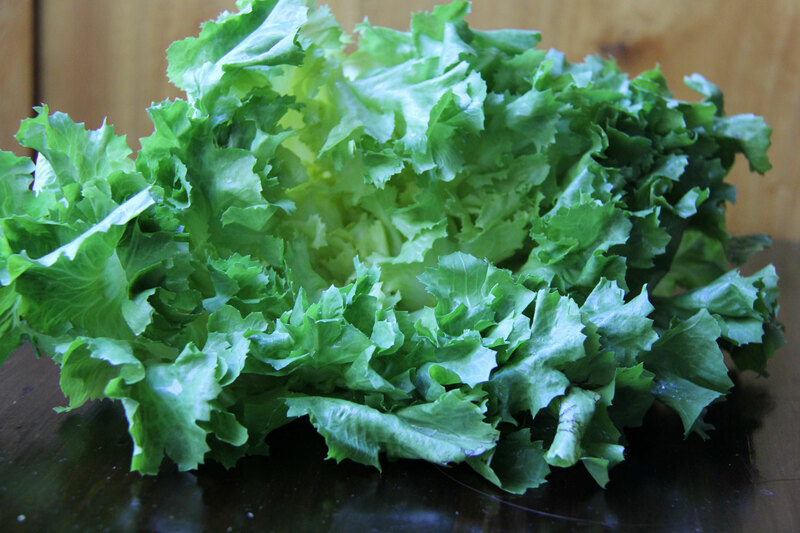 Escarole has a lot of water in it, which is released during cooking. The heads braise themselves in this juice, combined with the bacon fat and acids from the mustard. This would be lovely served with crusty bread. You could also serve it with German style roasted potatoes, with a little mustard/bacon dressing. There are few things more fantastic than hot potatoes and mustard vinaigrette. I was actually planning on making this with smoked duck breast, but when I went to the butcher today they had just sold out. They raise the ducks and smoke them (Marin Sun Farms), but they don’t always have it available. First, it has to be duck season, and second, the butchers need to be in the mood to smoke the duck. He said he’d be in the mood in a couple of weeks. So I bought some bacon instead. My butcher also raises the pigs and smokes the bacon. If you’ve never had really high quality, hand crafted bacon made from free range pigs…please get your hands on some. It’s not worth eating bacon otherwise. The bacon I get from my butcher is quite costly, but I only use a little and I don’t eat it often. It’s completely worth the price. Packaged bacon from the supermarket is generally a poor substitute, even if it is supposedly raised well. There are high end brands out there now that are better than the typical factory farm bacon, but they do not come close to really high quality bacon. Life is too short to eat second rate bacon. It would be better to make this dish with olive oil and no bacon, if it has to come to that. Please don’t eat crappy meat! The reason this dish is so good is because there are only a few ingredients and each ingredient is the best that can be had. This escarole is local, organically grown and fresh. The bacon is a heritage breed, raised free range on a local farm, and processed into bacon by my butcher. If you don’t use high quality ingredients, you have to add more flavorings in order to “jazz” it up. Basically, you are just masking the fact that you’ve chosen mediocre food. Don’t bother. Eat simply. Insist on the best ingredients. Get in the kitchen and cook! If you want to know more about how to choose pork products, read the buying guide for meat here.